My work is based on the diverse objects I see in everyday life. This inspiration has led me to create utilitarian wares and sculptural forms. "Shoe on a shoe tray" is an example of how this has influenced my work. In this particular piece the abstract images of the sea and rain are blended into the form of of the shoe. Kinichi Shigeno was born in 1953 in Japan. He immigrated to Canada in 1981 and later in 1984 set up his studio in Richmond. 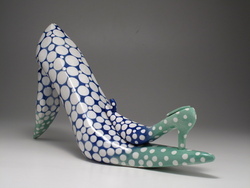 His distinctive style includes the use of cobalt on porcelain or white stoneware. 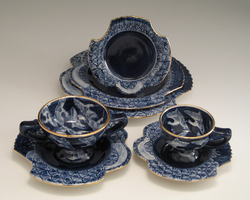 In 1991 he designed the tableware for Government House (official residence of the Lieutenant Governor)in Victoria.